When I saw this recipe in the Martha Stewart Living Magazine I knew I just had to try these! My daughter LOVES chips and cookies! If she had anything to do with it, all she would eat is chips! My kids and I whipped these cookies up yesterday morning. They love cooking/baking and had a lot of fun making these cookies. I think their favorite part was smashing the chips into crumbs! 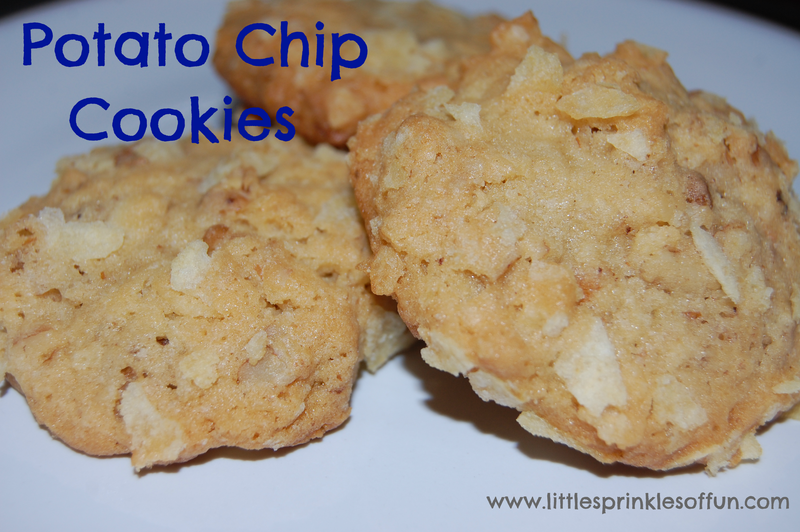 Now you might wonder how these cookies taste...my husband and kids gave them two thumbs up! They are sweet, salty and very light! Something different from your everyday cookie! But in a good way! 1.) Preheat oven at 375. Beat together the butter and sugars with the mixer on high until fluffy for a couple of minutes. Add vanilla and eggs, beat on medium until just combined. 2.) Add flour, baking soda, and salt. Beat on low until just combined. Stir in 2 cups of potato chips and the nuts. 3.) Roll dough into 2-inch balls, and then roll the balls into the remaining potato chip crumbs to coat. Put cookies on a parchment-lined baking sheet. Bake until golden, 15-18 min. or until done. Let cool and enjoy! Can be stored in an air tight container for up to 5 days. I just found your blog through the newbie blog hop and I am your newest follower!! I can't wait to try some of your yummy recipes! I would love for you to visit when you have a chance. I love salty and sweet. these look so yummy! Thank you for sharing the recipe. I am loving how your blog is a little bit of everything. Oh my these look good. At first glance I thought they were white-chocolate macadamia nut cookies. I would love to give these a try. Thanks for sharing!